The world’s most famous finding from a glacier comes from our very own prehistoric mass of ice: the glacier mummy Ötzi. The Ötzi Glacier Tour takes you over the glacier to the discover site on the Giogo Tisa ridge at 3,210 m (10,532 ft.). It takes place every Tuesday and upon request. The full-day circular tour is filled with variety and crosses the main ridge of the Alps. With its superlatives in terms of both landscape and archaeology, it is interesting for more than just lovers of mountains and friends of history. The undisputed high point of this glacier tour is the site where Ötzi was discovered (3,210 m / 10,532 ft.) with the fascinating view of the north face of the Similaun (3,524 m / 11,562 ft.) In addition, this tour offers the possibility of trying out climbing with a roped party and at sites with steel cables affixed to the rock. The smooth running of the tour to the most famous spot in our area requires the cooperation of the archeoParc, the Glacier Ski Resort and the Guide Alpine Passiria-Senales mountain guide association. Requirements and conditions for participation: suitable for people with good physical and mental fitness, no special technical ability required; for the ski tour: good parallel skiing ability, no ski tour experience necessary; with family participation: previous mountaineering esperience, tour information meeting. Starting from Kurzras. From the mountain terminal of the Glacier Cable Car, we will travel over the Hochjochferner (2,800 m/9,186 ft.) to the Schwarze Wand and on to the Hauslabjoch (3,280 m./10,761 ft.) We will then descend to the Tisenjoch (3,210 m/10,532 ft.), the site where Ötzi was discovered. Return to the Similaun Refunge in the early afternoon. We will then descend through the Tisen Valley to Vernagt (1,700 m./5,577 ft.) Return to Kurzras. Requirements and conditions of participation: change in elevation: ↑500 m (1,640 ft.) ↓1.900 m (4,921 ft.); walking time: 7-8 hours; suitable for people with good physical and mental fitness, no special technical ability required; for family tours: previous mountaineering esperience, tour information meeting. Starting from Kurzras. From there we will travel by cable car to the Grawand mountain terminal (3,100 m./10,170 ft.), the actual starting point of our tour. From there, we will travel over the Hochjochferner (2,800 m / 9,186 ft.) to the Schwarze Wand and on to the Hauslabjoch (3,280 m./ 10,761 ft.) We will then descend to the Tisenjoch (3,210 m. /10,532 ft.), the site where Ötzi was discovered. After a brief stop, we will ascend to the Hauslabjoch and descend into the Hochjoch Valley and continue down the valley to Kurzras. With suitable snow conditions, the course of the tour may change after the site where Ötzi was discovered: descent past the Similaun Refuge (3,019 m / 9,905 ft.) and through the Tisen Valley to Vernagt am See. Return to Kurzras. Requirements and conditions of participation: change in elevation ↑ approx. 600 m (1,969 ft.), ↓ approx. 2,100 m (6,890 ft.); duration: approx. 7 hours; basic physical condition; good parallel skiing ability (ski tour experience not necessary). All Ötzi Glacier Tours are planned and accompanied by nationally-certified professional mountain guides who greatly enjoy being underway along our glacier in both summer and winter. 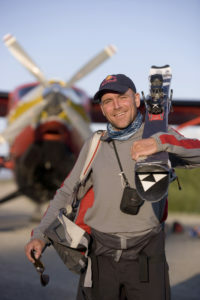 Axel Naglich from Kitzbühel (A) is well-known in mountain sports, regularly participating as a skiing mountain climber and extreme athlete in international competitions and expeditions since he was a boy. His attempt to carry out the world’s longest ski descent on Mt. St. Elias in Alaska is the subject of a film (directed by Gerald Salmina). The Ötzi Glacier Tour takes place every Tuesday and can also be booked as a private tour on any other day. Please be sure to leave your mobile telephone number with your application. If necessary, you will be contacted by phone by the mountain guide the evening before the tour. Hiking boots, suitable hiking clothing, gaiters, a light backpack with drinks and food provisions for the day, gloves, a cap, sunglasses, rain protection; for ski tours: your own ski touring equipment, ski rental available on site. Accompaniment by a certified mountain guide, the ascent with the Schnals Valley Glacier Cable Car, the use of technical equipment, admission for one to the archeoParc Schnals Valley, and a Certificate of Participation. You may pay the tour fee directly to the mountain guide at the meeting point, or else you may bring along the payment confirmation that you received upon application. You will receive a receipt upon payment. In the event that you are in need of a formal invoice with the complete information of the invoice recipient, please send your invoicing address and sales tax identification number to info@archeoparc.it. For cancellations by you seven days or less before the tour date: 50% of the fees, for cancellations within twenty-four hours of the start of the tour: 100% of the price. For cancellations by us: in the event of inclement weather, the tour will be canceled by the mountain guide or else moved to a different day upon consultation with the participants. The tour will also be cancelled if the number of participants is insufficient. In the event of a cancellation, we will refund participation fees that have already been paid before the beginning of the tour. However, no claims shall be accepted for a refund or reduction of participation fees in the event that the route of the tour is altered or terminated on short notice due to safety reasons.